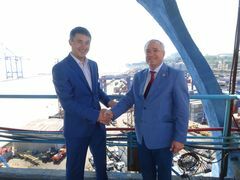 During International Transport Week 2015 in Odessa, Mr. Ciopraga met with Mr. Ruslan Sahautdinov, Deputy Head of the Administration of the Port of Odessa as well as Mr. Valentin Kasapchuk, National Secretary of the IGC TRACECA in Ukraine. The Parties discussed the issues of the potential of Ukrainian ports and stressed that Port of Odessa is among the most important sea ports. 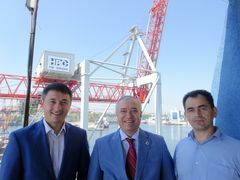 Mr. Sahautdinov and Mr. Kasapchuk introduced Mr. Ciopraga the port’s infrastructure and facilities and briefed on the latest developments. All Ukrainian sea ports are state-owned. Many ports’ administrations concluded lease agreements with private operators of the ports and shipping companies providing leasing of space in the ports, investments in container terminals and terminal’ operation. Among the priorities in the port industry there is capital fund renewal, improvement of the regulatory basis, the development of port infrastructure as well as electronic document management.